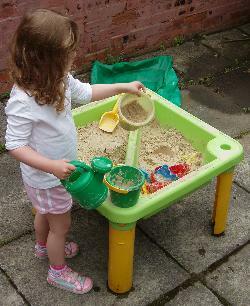 Price: £20 - £100 + the cost of the sand and toys. A large receptacle for sand, toys and (maybe) children. Gameplay: Children race to see who can transfer as much sand as possible from the sandpit to the surrounding area, their own shoes and each others' hair. In the process, castles and excavations may be briefly formed. Object: To get the children outside but contain their activity to a limited area so it's easy to keep an eye on them while you sit inside and have a coffee and read the paper. Game length: Until they get bored... or it rains. Number of players: Depends on the size and type of sandpit you've shelled out for. Age: From as soon as you're able to trust them not to eat sand, up until they're at least six. Comments: I seem to remember promising more reviews of outdoor toys if we had some decent weather this summer. I guess that didn't go so well. Ho well, never mind, now that here in Scotland the schools have gone back, we're bound to have plenty of sunshine for a week or two. Before all the leaves fall off the trees and we enter six months of darkness, I might as well share a few thoughts on sandpits. Plastic sandtable. This consists of a tray (deep enough to hold about four inches of sand) which is supported on short legs. Kids stand around it to play. Usually the tray is divided into two halves - one for water and one for sand. 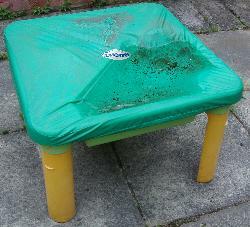 Plastic sandtray. This is a little larger but sits on the ground. Children can climb in. Wooden sandtray. A major installation for your garden. This has a foot-high wooden wall surrounding a base that can have an area anything up to the size of a single bed. It's not going anywhere in a hurry once it's full of sand. A hole in the ground lined with a tarpaulin. Cheap but requires a shovel. We have a sandtable and it has worked well. It's not very big but we've had five or six children playing around it at a time. A similar size of container on the ground would be a tight squeeze for a single child to sit in if they had the temerity to want a bucket and spade in there as well. I can't imagine that kneeling or crouching round the edge of a sandtray would we too comfortable - the kids might get fed up before I'd finished my coffee. Of course, with the sandtable, my children don't get the full experience of rolling around in their own little bit of private beach but, then again, I don't need to give them a shower afterwards. A quick brush down followed by a hand wash and they're ready for tea. If you want something on a grander scale, you might as well dig yourself a proper sandpit rather than messing with one of those wooden things. A hole in the ground will be easier to dispose of when the kids are older and only slightly less portable than a big wooden box full of sand. Whatever you get, you will need a cover. This is essential to stop the sand drying out and blowing away or getting soaked and turning into swamp. It will also keep off cats, pigeons and, as my parents learnt to their cost when I was small, cows. The waterproof, stretchy cover on our sandtable has lasted years without leaking. It nearly always seems to be sagging under a heavy puddle, however, and can be hard to remove without mucky water running off into the sand. 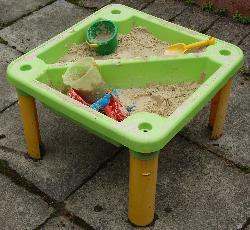 Our particular sandtable is no longer made but there are plenty of alternatives around. Watch out for intriguing holes in the design where children aren't supposed to put sand. Children will put sand in them. Also be wary of handy bits of shelf round the edge of the table - a child filling a bucket that's on one of these shelves will tip approximately half of every spadeful of sand on the ground. Oh, and don't believe the picture on the box of a child happily playing with sand in one half of the tray while their sibling gaily guddles about with a boat in sparkling water in the other half. They'd both be up to their elbows in mud within minutes. Conclusion: Sand is a low effort way to keep the kids entertained for a bit but you need to consider carefully what scale of set up you're prepared to deal with. Gets them playing outside without you having to run round after them. As long as the cover is on properly, it's available for use the moment the rain stops. Unlike other outdoor activity, you don't have to wait for everything to dry out. Messy in a way that doesn't require much laundry. Can require laundry if things get out of hand. You'll need to replace escaped sand on a regular basis. Takes up lots of space. Some sand will end up in your socks even if you don't go anywhere near the thing.